Book Drunk: Reviewed: On The Edge by T.S. Krupa. On The Edge by T.S. Krupa was published on June 9, 2015. Thanks to Caitlin at Royal Social Media for sending me a copy of this book to review. 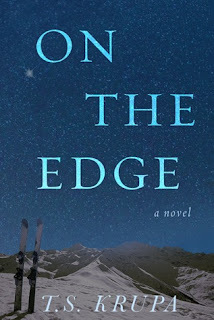 On The Edge is a really fresh, entertaining novel about a widowed mother and her daughter faced with a genuinely life-changing opportunity. From the first chapter, it’s easy to tell that Andy Parker is very over-protective of her daughter Hayden Grace – checking her messages, not allowing her to have her phone in her room at night or to stay at home on her own. Soon we see that Andy’s heart is in the right place, she’s actually just following the wishes of her husband Stefan who passed away six years ago. There’s a lovely bond between Andy and Hayden Grace and though things aren’t easy without Stefan, they are both getting on with their lives. Andy is dating a little – though not very successfully - and Hayden Grace is busy training and practising her snowboarding but when life introduces them both to professional snowboarder Paul Westcott, they see that maybe letting go and living a little could lead them to a much happier future and maybe a little romance along the way. 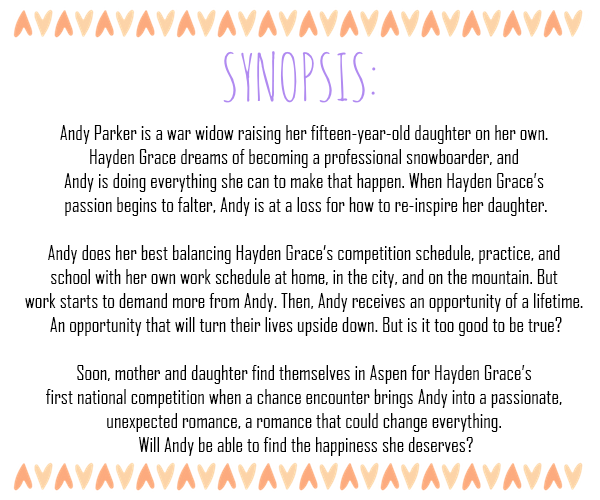 To me this story could have been written in two different ways – from the perspective of Andy (like it was) or it could have been told as Hayden Grace’s story, which is credit to how well the author developed her character. Andy’s daughter had a lot about her. She was very talented and passionate about snowboarding but she was very realistic for her young age too since it was acknowledged there was room for improvement in her ability and more importantly, she needed that bit of confidence to really push herself to compete to the best of her ability. Hayden Grace misses her dad and wants to know that he would be proud of her snowboarding performance but sometimes she struggles because he’s no longer around to tell her that. I liked seeing her character mature throughout this book but I was glad she was only growing up in some aspects because what made her easy to connect with, for me, was how I could identify with some of her teenage traits. Most teenagers are quite capable of being stroppy and sulking when things aren’t going the way they want them to (I can relate even though I’m not one to admit it…!). Hayden Grace has already had to face some of the harsh realities growing up like the day her dad didn’t come home and in this book she is tested by her friendships and her career prospects, but I loved the way she approached her life. I was a bit apprehensive about the amount of skiing and snowboarding content in On The Edge, since I don’t actually know anything about either sport. But that was never a problem because the author writes about them both in an accessible way, teaching the reader a little and making the sport interesting and readable without it taking over. I loved the bits of guidance Hayden Grace was given throughout the story because it was easy for me to pick up on the advice and see for myself how well she was doing and then I could follow the story better without feeling like I was reading a how-to guide. Also, there was a lot more than just sport to this beautifully written, captivating novel. The Parker’s are a strong little family and it was easy to be there cheering them on and wanting the best for them. T.S. 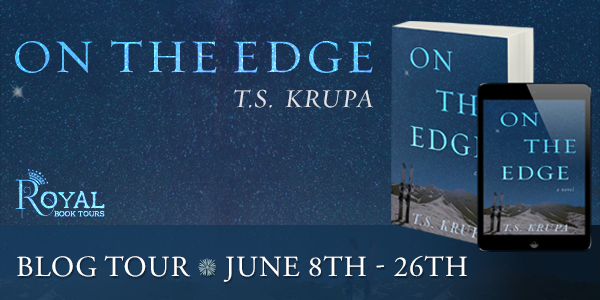 Krupa writes well about the challenges of growing up, having aspirations and falling in love and On The Edge quickly became a book difficult to put down as I sought out that happy ending for Andy and Hayden Grace. A heart-warming story with a fun approach to the sport of snowboarding and a romance that left me desperate for a happy ending. The blog tour continues here today with a guest post from the author and make sure to check out Hello...Chick Lit on Monday for a review from Aimee. My favorite was 'Remember the Titans'. This sounds like the type of book I would enjoy, I like the fact you mentioned in your review the lack of overly technical ski/snowboarding language as I can see that would be a worry for a lot of people in a book based arond the sport. Great review and definitely one to add to my list. This is a fabulous review. Thanks for your participation in T's Book Tour, Sophie!